Surrounded by the German Army, Allied soldiers get evacuated during a fierce World War II battle. For much of his career, Christopher Nolan focused on fantastic tales such as The Dark Knight and Interstellar. As a contrast, Nolan delivers a fact-based film via 2017’s Dunkirk, a story set during World War II. In May 1940, Allied soldiers find themselves pinned down by German forces. Stuck on the French beaches in Dunkirk, their survival looks hopeless. Nonetheless, the authorities refuse to abandon hope and they stage a massive sea-borne rescue. This leads to heroic efforts to evacuate as many soldiers from Dunkirk as possible. You’ll note I mentioned no character names in my synopsis, and that’s not an accident. The film does concentrate on a handful of roles, but these seem less important than one might expect. Actually, that’s probably not fair, as we do get to know some of the characters reasonably well. As staged by Nolan, Dunkirk takes us to the air, the sea and the land. In the first category, we focus on RAF Pilot Farrier (Tom Hardy) as he patrols the skies above Dunkirk and tries to prevent a German aerial assault. On the water, British civilian mariner Dawson (Mark Rylance) takes his boat to help evacuate the soldiers. Finally, the sands of Dunkirk reveal Tommy (Fionn Whitehead), a British Army private. Along with others, he simply tries to stay alive and escape. Nolan weaves these three areas together in a deft manner, though not one that delves into character domains especially strongly. Indeed, viewers seem likely to recall the name of only one role: Dawson’s young assistant George (Barry Keoghan). It seems clear that Nolan does this on purpose, as he wants us to notice/remember George more than the others. This occurs for reasons that would fall into spoiler territory if I discussed them in depth, but suffice it to say it’s not an accident that George’s name is the only one that “sticks”. I get Nolan’s decision to de-emphasize specifics participants, as I believe he does this to give the story more of a global feel. He wants us to see the broader struggle and not just celebrate a chosen few. However, this backfires somewhat, as the lack of great character delineation leaves Dunkirk with less emotional impact than one might prefer. Not that we don’t get a good kick from the tale, as Nolan explores the basic material in a fairly compelling manner. I just think that if we knew the characters a bit better, we might feel more concrete investment in their fates. As it stands, we care about most of the roles in a general manner but not one that carries a lot of emotional weight. 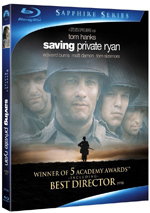 Still, Nolan manages an efficient, tight view of events – and one that clocks in at a surprisingly brief 106 minutes. That makes it Nolan’s shortest film since his obscure, experimental debut Following. This seemed unexpected, partly because Nolan’s films got longer and longer over the years. Including Following, only three of Nolan’s pre-2017 movies ran under two hours, and his last four prior to Dunkirk averaged 159 minutes each. Given the epic subject matter, it comes as a massive surprise that Dunkirk fills only 106 minutes. However, I can’t claim that the running time feels too short, as Nolan uses the space well. Would a longer Dunkirk better flesh out characters? Certainly, but again, it’s clear Nolan didn’t want that. He preferred a more event-oriented approach, and we get that. Whether that satisfies the viewer remains to be seen, and I find myself somewhat torn. On one hand, I appreciate the orientation toward events, as a Dunkirk that dallies with character backstories would lose pacing and could become tedious. On the other hand, I think the movie does lose something due to the lack of real depth in terms of its participants. As I mentioned, we care about the characters to a degree, but this seems more like a vague feeling of attachment at most, and the film loses some impact due to that choice. Nonetheless, Nolan does achieve what he wants, and he unquestionably maintains his ability to stage a strong action scene. Whether on air, land or sea, the various action segments – of which we find many – manage to leap off the screen and deliver riveting drama. Those become enough to sustain us throughout Dunkirk. I admit that the film doesn’t dazzle me, but that’s due to my high level of admiration for Nolan. Dunkirk doesn’t match up with his best efforts, but it still becomes a quality war flick. 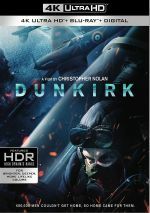 Dunkirk appears in an aspect ratio of approximately 1.78:1 on this 4K UHD disc - most of the time. The filmmakers shot much of the movie with IMAX cameras, and that used a ratio around 1.43:1. On the 4K, we see the IMAX shots at the 1.78:1 ratio I mentioned. The rest of the film used a 2.20:1 frame. 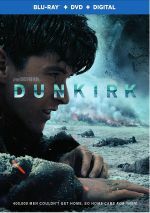 While prior Christopher Nolan flicks like Dark Knight Rises and Interstellar opted for IMAX material less than half the time, Dunkirk jacked up the footage to about 75 percent of their length. This made Dunkirk the first Nolan movie to “go IMAX” the vast majority of the time. Indeed, excluding the opening studio credits, the first 17:30 of Dunkirk used the 1.78:1 frame, and this choice to feature IMAX footage caused a terrific impact on picture quality. I expect Nolan films to look great, but Dunkirk’s use of 65mm IMAX meant it fared exceedingly well. It helped that the 2.20:1 material also featured 65mm film, so Dunkirk didn’t suffer from any obvious degradation when it shifted between ratios. Sharpness remained top-notch from beginning to end, as the movie boasted tight, accurate visuals. I saw no signs of jagged edges or shimmering, and edge haloes remained absent. The image also lacked any forms of print flaws. No one would expect a war film like Dunkirk to bring us a broad palette, and it hues came with the anticipated restrictions. Most of the flick opted for teal, with some orange tosses in mainly during shots on Mr. Dawson’s boat. Limited as the colors seemed, the disc delivered them with nice range and clarity. Blacks appeared deep and dense, and shadows showed fine clarity and smoothness. This became an excellent visual presentation. In addition, the DTS-HD MA 5.1 soundtrack of Dunkirk excelled, as the combat situations allowed for a great deal of active information. Obviously the battles fared best, as gunfire, aircraft, boats, bombs and other elements filled the room in a lively manner. Quieter scenes worked well, too, as they offered an engulfing sense of environment. Music displayed nice stereo presence and used the back speakers for a little boost as well. Audio quality seemed terrific, with music that appeared full and rich. Speech came across as natural and concise as well. Of course, effects dominated, and those offered top-notch reproduction. I noticed clean highs with no distortion along with deep, firm bass. All of this combined for a stellar sonic experience. How does the 4K UHD compare to the Blu-ray version? Audio remains identical, as both releases sport the same DTS-HD MA 5.1 soundtrack. Visuals become a different story, as the movie’s 65mm photography takes advantage of 4K’s potential. This means an image with greater definition as well as superior contrast and bolder hues. The Blu-ray looks terrific but the 4K outdoes it. None of the extras show up on the 4K disc, but the package provides bonus Blu-rays. The first platter contains just the movie, so all the set’s extras appear on Blu-ray Two. There we get featurettes under five connected: “Creation” (22:19), “Land” (16:39), “Air” (18:30), “Sea” (36:57) and “Conclusion” (15:19). All told, these cover one hour, 49 minutes, 46 seconds. Across these, we find comments from writer/director Christopher Nolan, stunt coordinator Tom Struthers, producer Emma Thomas, historical consultant James Levine, editor Lee Smith, sailboat captain Ivan Cornell, veterans Robert Halliday, Arthur Taylor, and Vic Viner, production designer Nathan Crowley, director of photography Hoyte Van Hoytema, Memorial du Souvenir VP Yves Janssen, Port of Dunkirk CEO Stephane Raison, executive producer Jake Myers, first AD Nilo Otero, Dunkirk Mayor Patrice Vergriete, associate editor John Lee, special effects supervisors Scott Fisher and Paul Corbould, special effects assistant supervisor Ian Corbould, visual effects supervisor Andrew Jackson, marine coordinator Neil Andrea, scenic artist Ed Strang, costume designer Jeffrey Kurland, ager/dyer Jack Taggart, pilot Craig Hosking, aerial DP Hans Bjerno, aerial engineer Andy McCluskie, Edge coordinator Dean Bailey, IMAX camera technician Scott C. Smith, sound mixer Mark Weingarten, Association of Dunkirk Little Ships Vice Commodore Simon Palmer, and actors Kenneth Branagh, James D’Arcy, Cillian Murphy, Barry Keoghan, Tom Glynnn-Carney, Harry Styles, Jack Lowden, Fionn Whitehead, Aneurin Barnard, and Mark Rylance. The programs start with a general overview of the facts behind the story and attempts to maintain accuracy. From there it goes into script, sets and locations, photography and working with IMAX cameras, various effects, stunts/action, costumes, ships and planes, audio and music, and final thoughts. My only complaint about these featurettes stems from their tone, as they tend toward lots of praise and many reminders how authentic the entire production is. This feels awfully self-congratulatory and gets a bit old. Still, with nearly two hours at their disposal, the clips offer a lot of good information, as the segments dig into all the challenges well. I’d prefer less self-praise, but the shows still provide a pretty engaging take on the movie’s creation. Though I don’t count Dunkirk among Christopher Nolan’s best films, that’s a reflection on his stellar filmography more than anything else. Dunkirk explores the wartime events with drama and passion, factors that make it a dynamic journey. The 4K UHD boasts excellent picture and audio along with a largely effective collection of featurettes. Dunkirk winds up as a fine war movie, and the 4K turns into the definitive way to see it on home video.